Flights from the US to Asia aren't cheap. You won't find an equivalent for the $99 flight to Europe. Nonetheless, after Kayak.com pulled flight data from its site to highlight the cheapest flight to Europe from every US state, Kayak provided similar data to Thrillist for a look at the cheapest routes to Asia from across the United States. 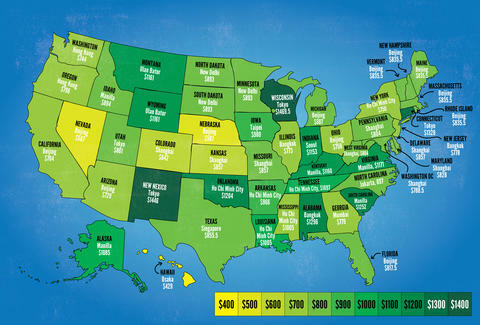 The map above shows the cheapest median summer flight price to Asia out of every US state. It isn't the single cheapest flight you'll find, but the best price on average. The prices are for round-trip fares in economy class. States without an international airport servicing Asia were assigned the closest international airport by Kayak. The prices certainly aren't as alluring as Europe, where some budget airlines have ignited a price war. However, there are still reasonably-priced flights available. Though, there is a wide range of prices. From the contiguous US, you could fly to China for as little as $587 (again, that's median, so you can find that flight for even cheaper) or, at the other end of the spectrum, it could cost you as much as $1,469. The vast majority of the destinations are in southeast Asia, which makes sense because the western regions of Asia are a lot further away. The most common cities are Beijing, Shanghai, Ho Chi Minh City, and Manila. Take a look below for a break down of Kayak's data, which could help you get a sense of where you might be able to go on the cheap from whatever state you're flying from.